Steve Huff is a legendary guide. He began guiding in 1968 in the Florida Keys after graduating from the University of Miami with a degree in marine biology. In 2010, he became the first full time professional fishing guide ever inducted into the IGFA Fishing Hall of Fame. His insatiable curiosity and passion for being on the water have driven him and his clients to nearly 50 years of great friendships and fishing. Steve possesses an almost encyclopedic knowledge of the details of caught fish, tidal influences on a particular area or flat, or how fishable a location will be in various sets of conditions. His knowledge is not only grounded in the cumulative total of 50 plus years of fishing, but also hidden behind the power of observation and his dedication to continued learning at every opportunity. As a pioneer of the tarpon fishery in Homosassa, Florida, Steve guided angler Tom Evans to six tarpon world records on four different line classes. Together with Del Brown, they popularized permit fishing, developing techniques for catching them on fly tackle with Steve guiding anglers to well over 2000 permit on the fly. 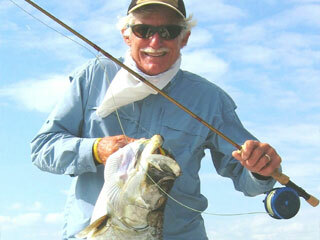 Steve and his anglers were formidable competition during Keys fishing tournaments. In the 1970s and 1980s he guided anglers to 13 championships in the Gold Cup Tarpon Tournament, the Islamorada Invitational Bonefish Tournament, and the Islamorada Invitational Fly Bonefish Tournament. Fishing buddies for decades, good friend Sandy Moret says of Steve, “He is without question the top fly fishing guide on the planet”.